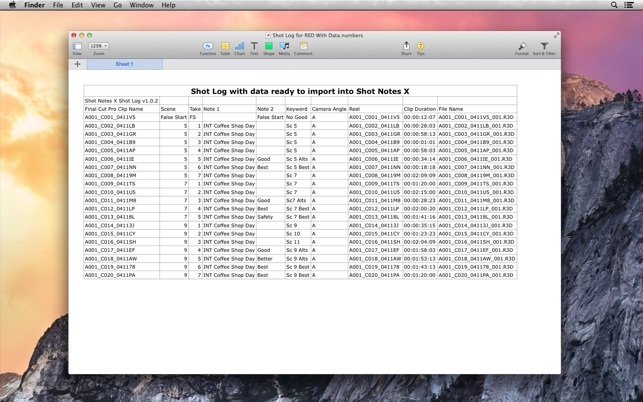 Shot Notes X, automatically combines notes from a CSV, ScriptE XML, or Movie Slate XML file with clips from Final Cut Pro X and Adobe Premiere. 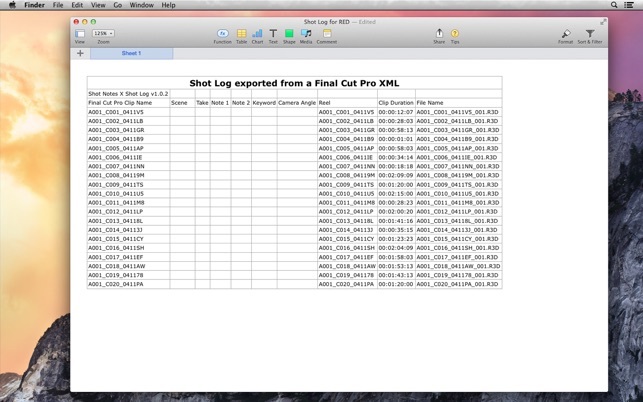 Use ScriptE, Movie Slate, or your favorite spreadsheet application to take notes on location or while watching dailies, then use Shot Notes X to bring those notes into Final Cut Pro or Adobe Premiere using the template provided by Shot Notes X. CSV files can also be exported from various on set script supervision applications, or FileMaker Pro. Shot Notes X combines the notes data with clips from a FCPXML, into a Final Cut Event or Premiere bin with complete metadata and named clips. In your NLE the notes are searchable via the search tools, and viewable in the list view enabling editors to quickly find the shot using their notes. Shot Notes X, reduces the amount of work required to start editing, saving time and money. In only a few seconds Shot Notes X can have all notes from a spreadsheet applied to the footage, making it ready for editing. Shot Notes X has been a big hit with editors, script supervisors, and post-production supervisors. 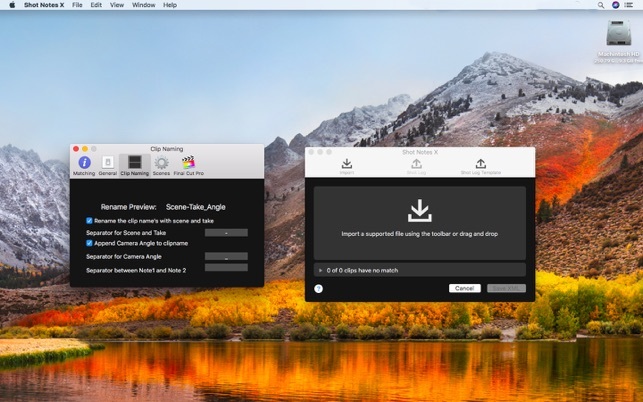 • Match clips with notes automatically using filename, clip name, timecode, or scene take and angle. • Supports Synchronized Clips and Multicam clips. • Option when creating Events/Bins per scene to combine scene and setup. Clips with setup information are now correctly grouped by scene Event/Bin. 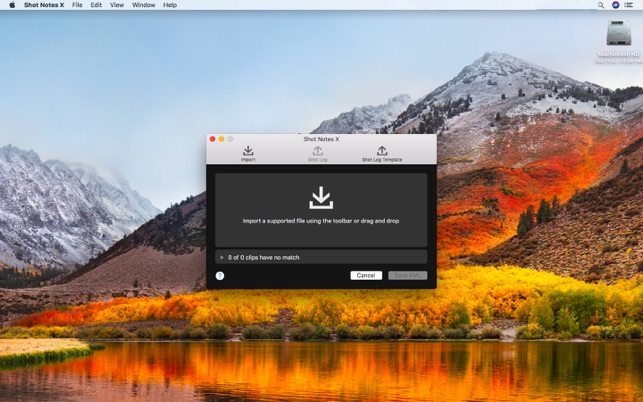 • Fix for FCPXML import error. Organizing is an integral part of editing. It can be tedious but is important to do. Before purchasing this app I did all the organizing in Final Cut Pro X, from keywords, events, all of that stuff. That took hours to do. Now that I have this app things are much faster and much easier. There are very few and simple steps. Just export out an XML from Final Cut then import into Shot Notes X followed by importing your notes made during the shoot in a .csv format. After that just follow a couple of steps and that is it! This app not only saves you money it also saves you hours of frustration. A must have for every editor working with Final Cut Pro X at a reasonalbe price. I recently downloaded this app for a project, and I”m so glad I spent the $50. It saved me hours. I had a Library with 130 clips, and I had to organize them into 30 groups, based on their specific content. I keyworded everything in Numbers, and then imported it into FCPX using this app. When I did, it created keyword collections for everything. Doesn’t work with Premiere CC at all, even though they say it does. Really exclusively for FCPX. Can’t even match Time Code from a clip to a note with identical code. Best part about it is that out of frustration I figured out how to make it happen with spreadsheets the way it should — so, a learnig experience. Worth 50 dollars? Not by a mile. Response time by developer was crazy slow. I am sadder but wiser.